The sacroiliac joint (simply called the SI joint) is the joint connection between the spine and the pelvis. It is a large diarthrodial joint made up of the sacrum and the two innominates of the pelvis. 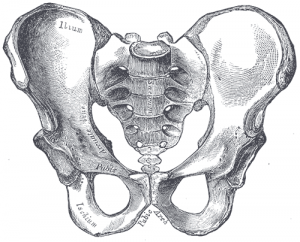 Each innominate is formed by the fusion of the three bones of the pelvis: the ilium, ischium, and pubic bone. The sacroiliac joints are essential for effective load transfer between the spine and the lower extremities. The sacrum, pelvis and spine-, are functionally interrelated through muscles, fascia and ligamentous interconnections. The main function of the SI joint is to provide stability and attenuate forces to the lower extremities. The strong ligamentous system of the joint makes it better designed for stability and limits the amount of motion available. Nutation - occurs as the sacrum moves anteriorly and inferiorly while the coccyx moves posteriorly relative to the ilium. This motion is opposed by the wedge shape of the sacrum, the ridges and depression of the articular surfaces, the friction coefficient of the joint surface, and the integrity of the posterior, interosseous, and sacrotuberous ligaments that are also supported by muscles that insert into the ligaments. Counternutation - occurs as the sacrum moves posteriorly and superiorly while the coccyx moves anteriorly relative to the ilium. This motion is opposed by the posterior sacroiliac ligament that is supported by the multifidus. The sacroiliac joint capsule articular surfaces are made up of two strong layers which are C-shaped. The capsular portion on the ilium consists of a fibrocartilage while the capsular portion on the sacrum is made up of a hyaline cartilage, providing internal stability. The capsule attaches to both articular margins of the joint and becomes thicker as it moves inferiorly (sacral cartilage thicker than iliac cartilage). Anterior Sacroiliac - an anteroinferior thickening of the fibrous capsule that is weak and thin when compared to the other ligaments of the joint. It connects the third sacral ligament to the lateral side of the preauricular sulcus and is better developed closer to the arcuate line and the PSIS. This ligament is injured most often and is a common source of pain because of its thinness. 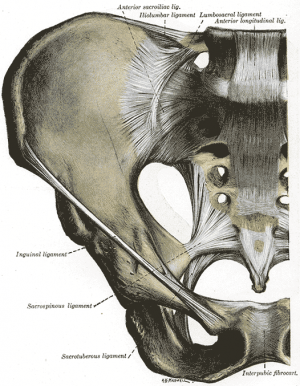 Interosseus Sacroiliac - forms the major connection between the sacrum and the innominate and is a strong, short ligament deep to the posterior sacroiliac ligament. It resists anterior and inferior movement of the sacrum. Posterior (Dorsal) Sacroiliac - connects the PSIS with the lateral crest of the third and fourth segments of the sacrum and is very stong and tough. Nutation, which is anterior motion of the sacrum, slackens the ligament, and counternutation, which is posterior motion will make the ligament taut. 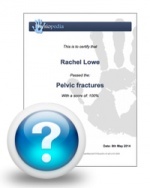 It can be palpated directly below the PSIS and can often be a source of pain. Sacrotuberous - consists of three large fibrous bands and is blended with the posterior (dorsal) sacroiliac ligament. It stabilizes against nutation of the sacrum and counteracts against posterior and superior migration of the sacrum during weight bearing. Sacrospinous - triangular shaped and thinner than the sacrotuberous ligament and goes from the ischial spine to the lateral parts of the sacrum and coccyx and then to the ischial spine laterally. Along with the sacrotuberous ligament, it opposes forward tilting of the sacrum on the innominates during weight bearing. There are 35 muscles that attach to the sacrum or innominates which mainly provide stability to the joint rather than producing movements. The reported prevalence of sacroiliac joint pain in cases of chronic low back and lower extremity pain is estimated to be between 10 - 27%. There are several reported predisposing factors for SIJ pain such as a leg length discrepancy, age, arthritis, previous spine surgery, pregnancy and trauma. Compared with face and discogenic low back pain, SIJ pain is more likely to be reported as a specific inciting event, and present unilaterally below L5 and the pain patterns are extremely variable. The SI joint goes through many changes throughout life. In early childhood, the surfaces of the joint are smooth and allow gliding motions in many directions. After puberty, the surface of the ilium becomes rougher and coated with fibrous plaques that will restrict motion significantly. These age-related changes will increase in the third and fourth decade and by the sixth decade motion may become noticeably restricted. By the eighth decade, plaque will form and erosions will be present. The ligaments of the SI ligament complex are weaker in women than in men, allowing the ability to give birth. Cohen SP. Sacroiliac Joint Pain: A Comprehensive Review of Anatomy, Diagnosis, and Treatment. Anesth Analg 2005; 101:1440-1453. Dutton M. Orthopaedic Examination, Evaluation, and Intervention. 2nd ed. New York: McGraw Hill, 2008. Levangie PK, Norkin CC. Joint Structure and Function: A Comprehensive Analysis. 4th ed. Philadelphia: F.A. Davis, 2005. ↑ 2.0 2.1 2.2 2.3 2.4 2.5 Dutton M. Orthopaedic Examination, Evaluation, and Intervention. 2nd ed. New York: McGraw Hill, 2008. ↑ 3.0 3.1 3.2 Cohen SP. 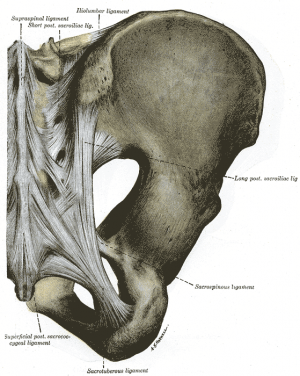 Sacroiliac Joint Pain: A Comprehensive Review of Anatomy, Diagnosis, and Treatment. Anesth Analg 2005; 101:1440-1453. ↑ 4.0 4.1 4.2 4.3 Levangie PK, Norkin CC. Joint Structure and Function: A Comprehensive Analysis. 4th ed. Philadelphia: F.A. Davis, 2005. ↑ Magee, DJ. Orthopedic Physical Assessment. 5th ed. St Louis:Saunders, an imprint of Elsevier INC, 2008.